...But Tam pointed out there is a compromise: why d'ya think they call those heavy concrete moveable lane dividers "Jersey Barriers," anyway? Close the highways and the borders (for their own safety) and let 'em have at it. You poor Jersey devils. Flee while you can. Ol' Joe has done spake. He says he's foursquare against a new "assault weapons" ban. Universal background checks, now that, he's kinda for. Oooo, C for effort pard, but you failed the course. And thanks for playing. Next! I woke up thinking maybe I'd been a little harsh -- after all, he is a Democrat. It's only fair to go to the Senator's own website and see what he has to say for himself. Answer: not much. Exactly zero on him opposing a new AWB and about background checks, this: "...the National Instant Criminal Background Check System,[...]. That system still does not work as well as it should and should be examined again in the coming weeks." And he led that off with a wistful observation about how the two parties came together in the aftermath of the Virgina Tech shootings to beef up NICS. C'mon, Joe, you can do better. Do you want to be the long-term Senator from Indiana, or another there-and-gone fluke? From my email inbox: "Hi, I'm [generic male name] of content.parasites! We'd like permission to republish your RSS feed on content.parasites. It's a news platform with over 5,000,000 visits a month and growing fast." No. Generate your own damn content. You can't have mine. Tough. You're not getting it. You're sure as hell not getting my guns. I stay outta D.C., NYC and Chi-town, and you stay the hell out of my safe. And I'm done listening to calls for "compromise." The antis don't really want compromise. They want whatever they can get now and they'll be back later for the rest of your firearms rights later -- followed by the rest of the Bill of Rights, already plenty nibbled-at. It's well past time to say "enough" -- and to keep on saying it, by whatever means it takes to get 'em to hear. Don't diss 'em. Just don't. Let's have us an Indy BlogMeet this coming Sunday, Febriary 3, 3:00 p.m., at Broad Ripple Brew Pub! 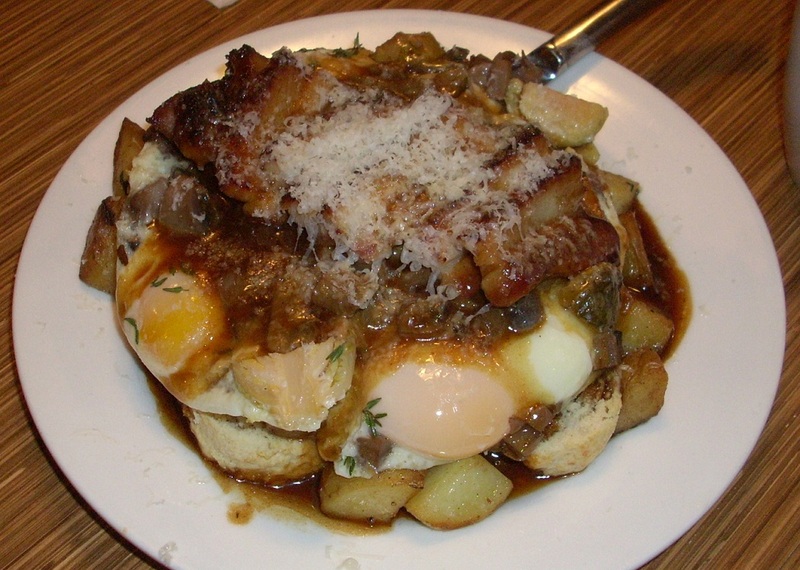 Eggs fried broken-yolked, in a hole punched in a slightly toasted slice of thick rye bread, with a little sliced early Vidalia onion and a slice of Swiss cheese melted on top, just a dab of bacon on the side: yum! ...Is an NRA-approved, GOP-complicit "compromise" that bans some or all private firearms sales. Citizens are not frogs; we have options other than leaping out or getting boiled. Contact your legislators and contact the NRA. Hold the line! When Does 47,565 Equal One Millon? When it's a Million Moms For Gun Control! (No link, look 'em up yourself.) Or maybe it's 103,087, which is the number Facebook says is "talking about" the group. They've got 47,565 "likes," meaning less than half of those talking about them actually like them. Meanwhile, their page has comments with links to pro-gun articles like this: Why this liberal no longer believes in gun control. ...And they say an ill wind never blows up real good! ...Curb your tingling leg; he says not much more: "...advocates of gun control have to do a little more listening than they do sometimes." And even that is couched in the bizarre city/county frame he has used in the past, in which people in "the country' and "hunting traditions," while city people have no need of icky g-u-n-s. Meanwhile, crimes against persons occur most often in -- class? Yes, that's right: in cities! I live in a city. I can't carry a policeman around. I do carry a gun. And you and your gun-control pals need to listen a lot more to that reality, Mr. President. Overslept, but I must have needed the sleep. Woke up briefly and looked at the news, found nothing of interest and went back to sleep. Upon awakening much later, Tam pointed out the nice little filet mignon in the fridge. Split, it made two delightful breakfast steaks as part of a delightful breakfast, alongside semi-poached eggs cooked in the same pan and with half an "everything" bagel. That makes the world look a little better. Someone I know very well is giving serious thought to quitting her job, due to her consistently, inexplicably hostile supervisor. The way I hear it, this guy likes to react to her innocently-meant words as though they were a threat or a challenge. And then comes on all aggrieved when my friend who he's going off on tries to explain that no offense was intended. Example: the other day, this fellow mentioned to her in a telephone conversation that she'd have to come in five or six hours early, a few days hence. Well, she's stuck with a union contract, and it requires a certain minimum lead time for mandatory schedule changes and his "have to" was uttered significantly after that. So she pointed out the shift change would have to be voluntary, with the usual agreement that it didn't set precedent, and said she'd come in. Alas, her boss went ballistic, exclaiming, "Your co-workers are enthusiastic to see a project through to completion." And no matter how she tried to explain, that was that, the conversation was over. ...And at the office, she's told he asked for volunteers. H'mmm, how about that. The kicker is, her boss has known about the early-start day for weeks. He had not imparted that information to his underlings. Later that day, when my poor fool of a friend tried to explain, again, about the issue with short-notice mandatory sked changes being a contractual problem, she was told to shut up, spend more time listening and less time speaking to her supervisor in a condescending manner. Her attempts to resolve the matter with higher-ups were met with platitudes and amusement. She tells me this has been going on for years. It's not quite open harassment, just goading. She's got a childhood history of being bullied and reacts badly to this kind of thing, becoming depressed and avoidant, gets stomach problems, and so on. She'd really like to quit. It's clear her employer doesn't want to do anything about the goading supervisor and she's concerned about the long-term health impact (her digestive issues have been getting worse and worse). But she's got family in town and house payments to make, and the job does pay pretty good money, more than she could make elsewhere; she can't afford to give up that job. I think she's just stuck. It's unfortunate, but we can't all afford to "go Galt," no matter how bad things are. One of them bothered to, at least. Dan Coats mailed me a remarkably bland third of a page that, as Tam commented, "Could have been worse." He expresses the conventional politician's sorrow about the Newtown victims -- which my letter did not mention -- before asserting that he "...support[s] Second Amendment rights for law-abiding citizens," which would represent an improvement on his past history. His most recent public statement on the subject is more encouraging but I think he still bears watching; this is a man with a history of "moderation in the defense of liberty." "Could have been worse." That's a darned poor epitaph for a political career, yet it's the best most politicians manage. This should tell us something about the choices we're offered. The Indiana Senate's Education Committee has sent a bill to the Senate floor that will require the teaching of cursive handwriting in schools here. ...Much as I love it, and have worked to get my cursive handwriting back to Palmer Method standards after years or relying on Chancery Cursive (essentially italic printing), wouldn't that time be better spent teaching the little creatures to touch-type? Some Indiana police departments are finding they can't buy as much ammunition as they want -- and yes, it's us mean, nasty horrible gun-owners who are to blame (dwindling minority that we are; I read that in HuffPo, so it must be true). With all due respect to the boys and girls in blue, I've got two words for 'em: Boo. Hoo. When the .gov starts talking about severely restricting the rights of citizens to keep and bear arms, that causes a reaction and not just from the entrenched few. There are a lot more new gun owners, in addition to the folks who already own firearms and decided to lay in a few hundred (or thousand, or...) extra rounds while they still could. (Anecdote is not data but you can find two new gun owners and one new shotgun owner in this blog post from sunny California and it's not quite the bitter clinger demographic the pundits tell me is buyin' all the guns.) Police armories are well-stocked and no one (outside of the New York legislature, where El Supremo Cuomo assures us police will still be carrying deadly high-capacity assault magazines designed only to kill, kill, kill despite the law limiting them to seven rounds max just like the hapless citizenry of that misgoverned state) is talking about limiting the access of police to arms and ammunition. Nope. But it's first come, first serve at the ammo sales counter and the price is directly related to the ratio of demand to supply. If the police don't like it, they can right* write their legislators and remember their friends and foes at election time, just like the rest of us. "Preparing for war?" the Left is musing. No, dears, we are already at war; it's just the nicer, non-shooting kind. Most folks prefer working these things out at the soap box/letterbox/inbox/ballot box level -- even those of us with plenty of cartridge boxes. * Dr. Freud? Dr. Freud? When is a tree at a rural intersection not just a tree? When it's the International World War Peace Tree, a linden to the southwest of Darmstadt, Indiana, marking the armistice that ended the First World War. It's a touching reminder of an optimistic time. The Capitol Building: Who Didn't Build That? I watched bits and pieces of yesterday's Endless Inauguration -- despite the speeches getting shorter, the day has become more and more like some kind of Imperial Roman ceremony, cluttered with tradition-accreted rites and set-pieces atop an originally fairly spare investiture -- and early on, some dignitary or another made a pretty speech referring to the Capitol dome, invoking Lincoln's decision to continue work on it during the Civil War Between The States* as a symbol of the unfinished work of building the nation. "Ha," thinks I, parroting the most recent version of Conventional Wisdom, "you didn't mention it was slaves who built that dome!" Then I wondered about it. Really? True, Maryland was a Union slave state through most of that war and the District of Columbia itself was tardy in eliminating the practice. The real answer is, "Well, no; and then again, yes." Early on we just don't know, but given the area and what we know about practices of the day, it is likely that some proportion of the labor on the original building was done by slaves. In the expansion of 1850, the use of slaves is a matter of record. But the dome? The one we see now is the second dome, and it was indeed built during the war years of 1861 - 1865. There's no record of slave labor being directly used on that work. (A better historian than I am might find much of interest in records of employment in quarrying and ironwork at the time; Maryland did not abolish slavery until 1864). However-- Atop the dome, there stands a large statue: Freedom. The design was executed in plaster by Thomas Crawford, then working in France, and shipped to the U.S....where the foreman at the foundry selected to do the work went on strike. There was one man with the requisite skill to disassemble the plaster design and make the complex molds who couldn't strike: Philip Reid. He was a master craftsman...and a slave. Work started in May of 1860 and in December 1863, Reid and his crew hoisted the completed five-ton statue to the top of the new dome. ...And he supervised hauling the statue up to its assigned place a free man: in April, 1862, Congress finally got around to abolishing slavery in the District of Colombia. In building Freedom, Philip Reid had gained his own freedom. I like that story better than the one about politicians and symbolism. * A phrase I have purposely chosen to annoy all sides. It's MLK Day, a day-off "holiday" for government employees. Pretty much everyone else goes to work. Note that it's only on government forms these days that they wanna ask into your "race;" most everybody else, from your employer to the grocery store to the idiot who just cut you off on the freeway, care way more about your ability and character than the color of your skin or who your ancestors were. I'm sure there's a lesson there. Interesting discussion at Roseholme Cottage this morning about best non-sand-barrel spots to unload/reload a handgun, ending in marked agreement at a solid (masonry) wall with grass or dirt in front of it. There was a negligent discharge outside the Indy 1500 yesterday. About the time Tam and Shootin' Buddy were departing, a man reloading a "45 caliber semi-automatic" handgun put a bullet right through his hand. The local firearms community is not impressed. Neither, I suspect is the guy who did it: when I arrived, a couple of hours later, police at the entry were still talking about it, "Yep, right through the palm of his hand, pow!" Yeesh. There's a lesson here -- past "don't be an idiot" -- about excessive, unneccessary gun-handling. The 1500 has a blanket "all firearms must be unloaded and peace-bonded*" rule, and that includes the sidearm you carry for self-defense. Your options are A) keep it concealed and lie to the nice people (not really proper and you'd better be darned sure concealed is concealed, or you go home early), B) lock your loaded gun in your car (bit of a security worry) or C) unload before going in, get the ziptie, then cut it off and reload once you're back outside. Option C is complicated by the total lack of any sand barrels (etc.) and a shortage of nearby exposed landscaping but it's what most people do. For most of them -- Tam, SB and me, for instance -- this has worked just fine. But any unnecessary gun-handling carries some risk and when you add likely factors of being flustered, inexperienced and/or complacent, the odds of a ND become non-zero. There's a local gunshop/range that has a sign at the door: LOADED FIREARMS MUST REMAIN HOLSTERED. Would that work at the 1500? I don't know. I do know the Four Rules are there for a good reason, and are not to be ignored even when it's just you reloading your own gun. * I'm told this is more of a SF 'con/Renn. Fair expression, referring to the ribbons or zipties used to formally "secure" large bladed weapons and simulacra in their sheaths, but it fits here, too -- those orange tie-wraps are largely symbolic. Yesterday was Edgar Allen Poe's birthday -- and I'll bet you didn't get him anything, either. - Broad Ripple Hipsters and Gunnies react about the same to a highwheel bike: half the adults and all the kids are openly delighted, and the remainder are one-quarter sourpusses, almost one-quarter who have a sly grin, and one-in-ten who says, "Neat!" or "That looks like fun!" etc. - Despite bikes being free admission to the Fairgrounds, there's a dearth of racks to lock 'em up. Found a place I didn't mind too much, a fence near a service entrance, and cleared it with the parking/security guy. But they otta maybe charge bikes carryin' grown-ups a buck and use the proceeds to buy some bike racks. - No line at 1700 for a show that closes at 1800, but a steady flow of people inbound nevertheless. And plenty crowded inside, too. - Mike Williamson's blog, which usually does okay, has been (his words) "burning up the Internet" with some 100K+ days for his various fiskings and rebuttals to Mr. Obama and Mr. Biden's goofy plans and proposals. --And he darned well should be getting that many hits. Mike's tables were pretty busy too, with his usual assortment of T-shirts, knives (practical and fantasy), books and collectable firearms. - If I'd wanted .22 LR, and I do, I'd'a been nearly outta luck. What is there is sellin' for $16/50 at best. I need to check stock here at Roseholme Cottage; when my Ruger Mk. II was acting up, I set some of the cheaper stuff aside for later. Astronomers must be optimists: you never hear them talk about the Moon being half-empty! Some of the national/international media, snug in their echo chambers, continue to sound the gun-control tocsin. Others are starting to sound worried. And they should be. The right to keep and bear arms is still a third rail in politics -- or perhaps a tempting-frozen streetlight pole on a cold winter's day. Despite past history, some politicians can't resist finding out for themselves. Tongue frozen stuck yet, Mayor Bloomberg? President Obama? Mr. Biden? ETA: Joe Donnelly, still a cipher. Sleight of hand to avoid undue pressure from his own party, or just a slight? I dunno. But Joe, I will be checking your votes. Senator Dan Coates stands up for RKBA. Representative Andre Carson, predictably, blathers about the 2A...then carefully triangulates himself right behind the President. It saddens me to see this from a man who probably does know about the Black Panthers open-carrying loaded guns while non-violently protesting in California in 1967 and what a panicked state legislature did about it -- saddens me but does not surprise me. I guess The Man can keep the people down, as long as Congressman Carson gets to be The Man? Across the aisle, Our Ms. Brooks (Congresswoman Susan Brooks is Roseholme Cottage's Rep 'cos we are just outside the Carson Line) hasn't a thing to say about RKBA so far. Tsk, and her a good Republican, too. Ma'am, your response to this question will count towards your grade. Other bills would keep state agencies -- including universities -- from "prohibiting the possession of firearms, ammunition or firearms accessories...", limit the arrest ability of J. Random Federal Enforcer and -- yet again -- the Indiana Firearms Freedom Act returns. I can't find the link but reportedly, Governor Mike Pence has said he's opposed to any new gun control in Indiana. That's what the big ol' VETO stamp is for, Governor. * Note the layers of editorial oversight: the studio reporter refers to "permits to buy a gun." That's not how it works in Indiana; a permit is only required to carry a handgun. ...It goes for me, too. Molon Labe, ya would-be nannies. Looky, we're in for a long hard slog against a President who'll be standing in the door waving an ax handle and emoting about "Gun control now, gun control forever" the whole time. They want to treat gun owners the same way they treat smokers -- and it's up to you and me to stand up and refuse to ride in the back of the bus, or be dragged behind it. Be sure to look for his human shield of innocent children -- remember, it's despicable when Saddam Hussein does it, but a-okay for POTUS. Right? Labels: eediots, marvels of politics, things that go bang, things that will go bang, What Would Gutenberg Do? [NYC Mayor Michael Bloomberg] called on the NRA to accept what he said are "reasonable" limitations on firearms, such as restricting guns to minors, criminals and people with psychiatric or substance-abuse problems. [Emphasis mine] Got that? If you're not a minor, a criminal, loopy in the legal sense or on dope or booze, no guns for you! Y'know, I'm not sure who screwed that up, the reporter or Hizzoner, but I don't want either one of 'em writing gun laws or any other kind, either. Their brains are broken. "English, [deleted]! Do you speak it?" The best writing touches people's hearts. Frank W. James can write -- and he's got some new friends. ...And it's a doozy. No private sales, an "assault weapons" ban, limits on magazine capacity*and universal registration, for starters. Part of me want to cheer 'em on -- yeah, swing for the fences, victim-disarmers, and get hooted off the floor. And then there's the hardliner part who wants 'em stymied before they can even wave a list of "known NRA members" or whatever. Scroom. "I'm here, I'm armed, I won't let my rights be harmed!" We've got the soap box, the postbox, the telephone box, the inbox and the ballot box. Maybe once they run outta yammering fools, we can even get a smidgen of sense through the ijit box. (and you thought there were only three boxes or perhaps the modern four, total!) Gotta keep after them -- they're not going to let up on us. * Is this a good time to point out that two of the four most recent deranged crowd-shooters were slowed up when oversized (30 in a handgun, 100 in a rifle) magazine jammed? Labels: eediots, marvels of government, marvels of politics, things that go bang, What Would Gutenberg Do? I haven't commented on the (latest) James Yeager flap so far - but he provides a graphic illustration of a simple principle: If you carry a gun, don't make threats. Not following that advice has backfired very badly on Mr. Yeager and we may all get a little splattered from it. Don't play into the hands of those who would disarm you; stand up to 'em but don't go posturing and drawing lines in the sand. All it does is play into their hands by giving them someone to point at and stoke people's fears. Yeah, yeah, the right to free speech is normally construed quite broadly. So's the right to be a fool. Doesn't mean ya otta be one. I should not have to find out from a science fiction book that, attempting to treat my migraines, my doctor has given me a blood pressure medication that tends to erase stressful memories. Seems to require significantly higher doses than I was prescribed. Still, you'd think something like that would have been mentioned. ETA: Crap! I can't seem to remember who's President! 0715: This time, I mean it. 0745 - 0845: Blog, news, etc. 0845 - 0945: Ablutions, agonize over hair, give up, find hat. 1145 - 1215 Clean-up and socializing. Have I mentioned how nice the range is? It is and so's the staff. The bays are nice and deep, with plenty of space and a stout wall on each side. Every few bays (5 or so), there's a block wall about 15' long, too. The sound lock is a little small and they're going to tweak that during their next shut-down. 1245 - 1315: Return to Roseholme Cottage. 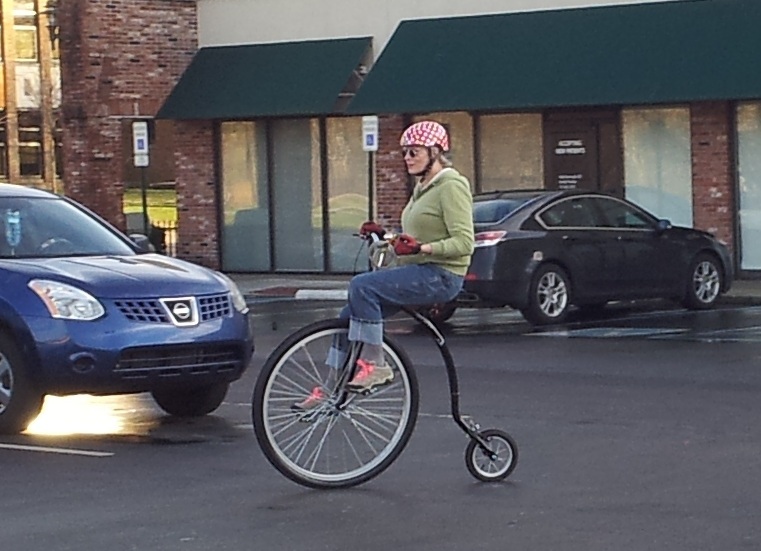 1330 - 1415: Ride my pennyfarthing bike to Taste. Enjoy the "chipotle pulled pork and eggs" (and mashed avocado and potatoes and cilantro and some home-fried chips of some sort) and a cuppa good coffee. Almost took a spill making a U-turn in a tight space, but managed to keep the wheel turning. (It's easy to get your foot off the inside pedal in a tight turn, not so easy to find the pedal again!) Asked, "Is that thing hard to ride?" Answered: "No, but it's tricky to start." 1415 - 1430: New double-front work jeans arrived! The others are all ready for the wash, so I start the Maytag up, then go try to start my motorscooter. No dice. 1430 - 1530: Realize the oops-too-late leafpiles are all exposed and we've got plenty of leaf bags. Fill up seven (7!) from heaps in tiny side yard. While so doing, it dawns that I had not opened up the fuel valve on my scooter. Derka-derka! 1545 - 1615 Repair of the larger ham antenna, a 102' G5RV that runs nearly full length of my long and narrow lot. The rope holding the front yard end broke several days ago; this would be the end Jim "Tree Machine," our occasional arborist, had anchored for me about 30' up, after the (climbable!) half of the tree I had been using kneeled gracefully over into the street. I can't get to the screweyes he used but my 25' extension ladder gets me up higher than the peak of the house, which the antenna has to clear, so voila! I'm back in the big wire antenna business. Sure, there was some scary waving around of a big hand-cranked drill to make a pilot hole and passing traffic was slowing way down to look at the crazy lady way, way up in the air, but I got it done without any rapid trips to the ground. And yes, I shut off the scooter before commencing to risk my precious self on the ladder, I'd've hated to leave it running while being sirened away to the nearest ER. 1615 - 1730: Garb up, get scooter out, check tires and oil and off to the store I go! It ran nicely, though the damp and muddy streets up in Broad Ripple Village proper give me pause. Not as slick as they look, though I eschew the humongous puddle at the southernmost entrance to the Kroger lot. No "$100 Hamburger" trip this, I'm out of important supplies: cranberry juice (it ain't breakfast without it) and Reese's Cups. 1730: Zippity-buzz back home in time to find Tam, who's actually been there quite some while. Folded jeans. Put away tools and cycling attire. Made coffee, got on the Internet and yakked with Tam about the movie, etc. Pretty darned good day. If I can manage to get on my ham rig a little before it starts raining and raining and raining (so it is forecasted), I'll've hit about all the bases. Light content -- I am (planning!) to be off to the range. In a wider sense ;), consider that both UFO and the earlier The Invaders are obviously disinformation, black propaganda tending to discredit any leaks about the Hidden Frontier as detailed in my writings at I Work On A Starship. C'mon, look at the obvious parallels: bell-shaped "flying saucers" landing onesie-twosie in isolated locations, humanoid-looking aliens (or humans taken over by aliens), opposed by a lone man everyone thinks is nuts (The Invaders) or a covert organization (UFO, obviously a reference to the USSF-NATO alliance then waging a war of feint and standoff with the Edgers' "Federation of Concerned Spacemen"). UFO in particular all but hangs a lantern on it by hiding SHADO HQ under a film studio! Anyone trying to reveal the real facts after those shows had been on the air would have been laughed at. Please join NRA or renew your membership if you haven't already. Are they perfect? Oh, hells no; but the NRA is the loudest voice we have, ad the only one with all the legislators addresses, phone numbers, favorite beverages and lobbyists who know what buttons to push. They're also your best chance to do a little button-pushing yourself -- they're always looking for volunteers! What a range! 20 lanes, shiny-spankin' new and well laid out. I'm impressed and I will be back. The store proper is good-sized and was very well stocked before the latest political flap; today it was A) busy (on a weekday afternoon!) and B) while the stock was decent, they have sold a lot of guns and related items; the crowded cases seen in the video are crowded no more. --Remember, new guns are arriving every week. The range is accessed via a hallway at the back of the store, where there is a staffed control/sign-in counter (and paperwork to fill out); from there, you pass through a (tight) sound lock and enter the range at one end. Tam and I were on 12 and 11, just past halfway. There are electronically-controlled target carriers and plenty of countertop. (There is also a range officer, btw, something I was happy to see.) I was able to try out my various new guns -- the little H&R .22 top-break has issues (they no go "bang" consistently), the H&A "Christmas gun" top-break revolver in .32 S&W works just fine (and makes a truly thunderous boom! 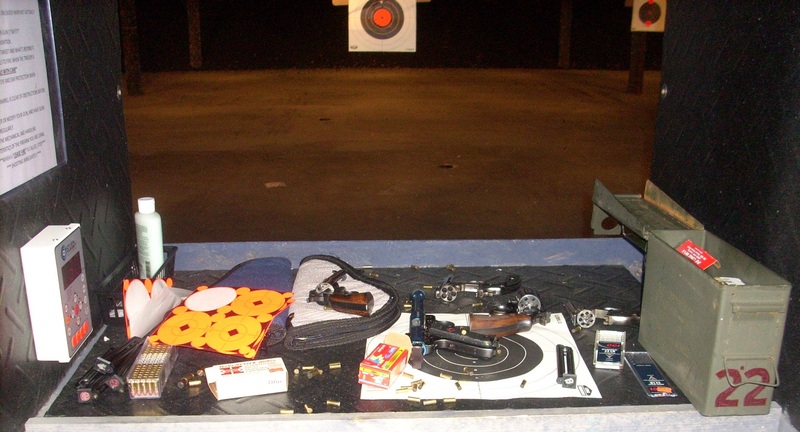 ), the Savage single-shot unrevolver is a treat (I need to center up the sights*) and the S&W K-22 Combat Masterpiece? ...wow... Just wow. Fits my hand, DA is smooth as can be, and ka-pow! The bullets go right where I was aimin'. Like my other two best .22 revolvers (High-Standard R101 and the Iver Johnson Sealed 8) -- and the Ruger Mk. II with Pac-Lite upper -- the mechanics of the gun run so well, they just get out of the way of the process of lining up the sights and pressing the trigger. It truly is a joy to shoot; the lockwork is easily the smoothest of any .22 I own. This is "Team INGO's" home range, by the way. * N.B. : Though I keep waiting for the first counter-example to show up, I have yet to own a handgun that didn't shoot to point of aim at 7 to 10 yards once the sights were mechanically centered. If you consistently find yourself cranking the rear sight to one side or another, that's a sure sign you need to get some help with how you are shooting; or anyway, it was for me. ....and yet.... It's so totally "Winston Churchill...innnn spaaaaace!" I haven't yet mentioned Turk Turon's New Years resolution. It's a good one, something you may want to consider for yourself. Flip side, here's an NYT opnionator who wants to scrap that icky old U. S. Constitution. It just gets in the way of all that Creamy Federal Goodness, you see. Wonder how he felt about that when there was a Republican livin' at taxpayer expense at 1600 Penna and GOP majorities encamped at both ends of the Capitol? Labels: marvels of government, marvels of politics, the wonderfulness of you, things that go bang, things that maybe should go bang, What Would Gutenberg Do? Tinfoil? Check. Hat? Check. Tragic Fate? Check. Gloating at HuffPo? Check. Keith Ratliff, manager of YouTube channel FPS Russia, was found tied to a chair and shot in the back of the head three days ago. Over on the gunnie side, there's folks looking askance at the crime, finding it a bit over-timely. Meanwhile, Caleb at Gun Nuts from August, 2012, when a cameraman for FPS Russia met up with flying shrapnel from a stunt gone wrong: "The problem is that his attention to safety is non-existent, and it was only a matter of time before someone got injured during one of his idiotic stunts." Halfwit HuffPo pseudokarma? Conspiracy? Misadventure? Unclear at this point -- and well worth keeping an eye on, however it plays out. Is it the new hobby of NBC talking head Matt Lauer? He spent several minutes of an interview this morning hectoring Chris Christie, the Republican Governor of New Jersey about if he would or would not support a "Federal ban on assault weapons..." or "...high capacity clips...."
While Governor Christie correctly pointed out his state's tough gun laws (I'd call 'em insane), he otherwise refused to answer, deflecting instead to issues of violent video games,* metal health and drug use, he never did own up that a Federal ban as strong as the previous AWB would have no effect in New Jersey (well, very little; the NJ magazine-capacity limit is 15 rounds). Neither man saw fit to mention that the rifle used at Sandy Hook was A) Not legally possessed by the killer and B) Compliant with Connecticut's own AWB. A spankin' new Federal AWB is high on NBC's wish list; it appears to be high on the Democrat wish list as well, and never you mind that the last one cost 'em their majority and possibly the Presidency as well. Much as I love to see elected offices get turned over at the Federal level -- I don't think we should ever let any of 'em get too comfy -- it'll be better to stop this lunacy before it gets off the ground, before millions are punished for the criminal acts of one deranged young man. The Left and their mouthpieces are going to keep pushing this. We need to keep pushing back. * I'm not convinced this is any more a "scourge" than violent films and TV shows -- or kids, most of them boys, playing any of the pretend soldiers/cops'n'robbers games they've probably been playing since their ancestors wore skins and hunted the Great Sloth right off the planet. I think it's hardwired right into their brains. Labels: eediots, marvels of politics, things that go bang, What Would Gutenberg Do? I haven't been much on the gun-grabber issue of later, as I figure if you're not already contacting Your Person in Washington -- and your state Capitol -- I'm unlikely to be able to nag you into so doing. I will point out the antis have taken once more to calling normal-capacity magazines "assault clips" and breathlessly claiming they're "only intended for killing." --Like the "ultra-deadly 15-round assault clips" in a soldier's Beretta? You know, the sidearm carried for last-ditch self-defense? I certainly hope it's deadly, given the alternative, but the goal is stopping an aggressor. That's generally the job of handguns. It is possible to shoot a handgun very accurately indeed, but as a general rule, it's a replacement for a sword, a replacement that requires less strength and less skill to use, most often employed at swordfight distances. --Just like criminals, the antis don't want you to be able to defend yourself; it scares them. Criminals have plans for you and your property that self-defense thwarts -- so what plans have the antis got? But that's not the only reason from my post. I think I've figured out one reason for Hostess's (former) dominance in snack foods! "Little Debbie" sells analogs of most of the ol' Hostess products along with some original treats. One major area of divergence is ease of opening the packaging; if you were hankering for a Nutty Bar or a Cloud Cake, you'd better have a knife handy to get it outta the cellophane. Sugar, eggs, flour and milk, that's established art. But plastic? I guess that's way harder to get just right. But I am on vacation! This did not stop work from calling me four times yesterday, starting about 1 a.m. --Nobody's inessential but some are more fun to bother? 1. Premise: rewiring to to replace a bad UPS with added load on a good one: true enough; the bad UPS had dumped on us a couple of months earlier, resulting in a weird, "spotty" outage, as a handful of racks were powered from it only and three others had a mixture (! ), in one case involving an unmarked (!) power strip. But the other two UPSes, I just made up; we work without a net except for a handful of small "stand-alone" UPSes that carry a few individual racks or devices therein through generator start/transfer. 2. Cast: actually not too far from reality, though persons/personalities are different. A. "BLOOOooooop." Really happened. I wish it hadn't. B. Distressing loss of data comms: also really happened. The backup I tried didn't work and I was deep into the book before I called the supplier of the device (and maker of the thing it talks to) for help. They had very little help to offer but the on-call support guy, about fifteen minutes into the call, admitted "...all I know for sure about that thing is 'disconnect the serial data when rebooting.'" Oh. See, that's not in the book and the little gadget puts up a detailed web-based UI; who knew it wasn't clever enough to reboot hot? Not me. But you'd better believe a note to that effect is in the book now -- and it'll get a label bearing the same warning, too. Support tech was befuddled to learn that was The Fix, perhaps he didn't think any customer could be so ignorant? The ill effect of the malf was nowhere near as dramatic; we'd've just been yelled at over it and possibly sued. Which would have been Bad, but it's not quite the same as the engines having to deal with the full realspace mass of a huge starship! 4. Breakfast: I cooked that myself, between the initial "I'm Just In" post and starting to write "The Overnight Report." Ate it during and it was darned good. 5. Driving home in the dark, on ice, exhausted: Just Say No! But I couldn't. Left that right out. Might as well start with what I'm eating now: an omelet of genuinely impressive weight and density: filled with diced pork roast, carrots, chives, some leftover -- and sans dressing -- broccoli coleslaw mix and a little random hot pickle, topped with a slice of Swiss cheese. A truly fridge-clearing garbage omelet and I don;t care what your option of it is. It's ambrosia! Some months ago, when the boys from the Power Room pointed out to Dr. Schmid, Lupine's 2/O and my boss's boss some irregularities in the assignment, designation and projected end-of-life of the UPSs (and one in particular) serving the Engineering control-type areas (Drive Control, RF/Reaction, the large electronics-rack compartment betwixt 'em and trailing off into Jump Control, that worthy nodded sagely and allowed as how we'd have to set a time to put it right after having made proper arrangements to, and I quote, "Minimize the impact." The Chief decided that the "impact-minimizing" part of the three-ring foofraw should fall to -- or perhaps on -- Gale Grinnell (he's a tough old dude, don't be fooled by the gender-neutral name) and little ol' me. My first thought was along the lines of "Ejectejecteject!" but from out here where the starlight is runnin' thin it's still an awfully long trip home even if I were to steal a bicycle, so instead I tried to look sanguine, sagacious and mildly curious while asking if we were going to be doing this in Jump? The Chief asked if I was taking up making faces as a hobby and allowed as how that would be a darned poor notion; the work scheduled for the run-in to approximately-neutral Smitty's World, next stop in our little show-the-flag tour and a little over six weeks away. Not a bad choice -- lacking the usual sort of star, Smitty's is a wandering planet, a frozen ball of (it says here) carbonaceous chondrite, thorium ores (!) assorted frozen gases accreted from Ghu knows where, and a whole lot of ice-type ice: it's hard to see, despite radio beacons, honkin' overpowered transponders and assorted other tricks you'd like to know about, which means starships drop out of 'Drive early and sort of feel their way in, leaving plenty of extra time. Time for things like, oh, I dunno, shoving a huge lot of load from uninterruptable power supplies U4A and U3A onto U1C and "unprotected power." Because aw, hell, what's all that junk do besides help us avoid stuff we might run into? Plus U1C is nearly at capacity and U2FGP,* we do not even consider adding more load to. So, plenty of time for prep, plenty of time for the job, right? From, it's a skip, a hop and a lot of cadging parts to me, sitting at a bench, frantically wiring up receptacle strips to power cords for temporary use, making 1.5X as many of each type as I think were gonna need, while the erstwhile Grinnel, G. and Conan the Objectivist scrounge extension cords. Comes the day -- actually, an "overnight" watch, which means Conan (t. O.) gets swept up in fun, that being his normal shift, more or less -- and there we are, having already moved everything we could square with our consciences to leave unsupervised over to plain, un-backed-up power, checklists in hand, temporary power strips and quad boxes tie-wrapped and Velcro'ed in position, finishing up the last of the must-dos when a moon-faced kid from the Power Room shoes up carrying to radios. "Kid," I say, and Joe is young; but he looks younger and talks like the huntin', fishin' country boy he was and still is, and never you mind about the EE (power) degree, or the reactor-engineering certification. He's the 2200-to-0600 el Supremo down where the fusion roars and the MHD units run ripplin' to the stern, and he's here to put us in the loop, with a hearty, "Heya, tube-rats. Bobbi." "That's us," I told him, like he didn't know. "Are your guys ready?" He snorted, "We've been ready. Question is, are you?" "Just about. Gale? Ask the big boss if we're good." Doc Schmid himself came around the corner, looking as harried as he ever does (not much) and took a radio. "We're ready. Pull the switch." ...Of course something went "BLOOoooooop." Half the monitors went out and I heard Sol West in Drive Control splutter, "Hey!" The 2/O didn't even blink, just keyed the radio, "Back on. Back on." He let up on the switch, fixed Gale and me with a beady eye: "Find it." We did, stupid Dansteel data-buffer frame in rack 70 plugged into an unlikely circuit, and the go-command was given again. Noting important went out that time, though a half-dozen alarms started beeping from the things with two power supplies we'd left half on the now-unpowered UPS. I made a quick walk-through of RF/Reaction and through the rows and rows of racks, ending up at Drive Control where Sol looked resolute but gave me a thumbs-up. The row of second-priority monitors at the top of the bulkhead his the DQ console faces were all out, items being monitored elsewhere or low-pri enough we were letting the slide. I made my way back trough the racks -- meeting Gale, Conan (the Obj.) and the 2/O along the way, and through RF/Reax, across the passageway and into the Engineering Shop. Nothing to do but wait! ...I was just about snoozing when the seldom-used PA clicked on. "Need an engineer in DQ. Engineer to DQ!" Strolled out the long way and met Conan and Gale at the hatch. Beyond, Sol was fuming. "I don't have no censoredly-deleted intercom! Navs says they've been yellin' at me for five minutes and there's no way to even tell!" Couldn't be in his panel; that's just controls and some basic audio. Off to Rack 15, Operations-commo, and looky! A whole row of, oh, call them crosspoints, dark! --But don't they have dual power supplies per row? No. No they do not. The have bright, shiny lights that I had assumed indicated dual supplies but really only let you know the two (count them, two) DC power rails are live -- and it takes both of them to tango. (I know that now.) Ah, but sometime long ago, we'd been careful! We'd moved the critical intercom stations to one row, and put it on -- guess, oh, just guess! -- the UPS. The the US, the one that is presently off. Easy enough to correct and so I did. There were a few more brushfires and then Sol found me to announce he wasn't getting any data from the 'Drive finals, idling just enough to modulate Lupine's effective mass, and the other data he was seeing indicated a problem. A real problem: "Are you feelin' kinda light, Bobbi?" Maybe I was, at that. I sat down at the RF/Reax data terminal and started digging and eventually figured out a serial-to-ip tunnel interface wasn't talkin', a Harlington-Straker ESD1400 (if you're taking notes). The more I messed with it, the worse it got; and I was really feeling light. I weant back to the Shop and grabbed a laptop, called up the manual, headed back to the terminal and dug in; about then the new, improved UPS configuration came online but I hardly noticed. I did notice when Doc Schmid slipped in behind m and leaned against a rack; when I looked back, he asked me how it was going. "Not well, sir. Not well. It's got data coming in -- good data -- but it's not pushing packets out." "So put in the spare." Awkward: "D- Sir, that is the spare. The spare." He just nodded. I'll hear about that later, probably after The Chief has. Oh, my burning ears! I finally thought to bring up the "Notes" tab. One line popped up on the page I was at: DO NOT REBOOT WITH SERIAL INPUTS ACTIVE. IT'S NOT SMART ENOUGH TO RESTART WITH LIVE DATA." Could it be that simple? Really? I tried. It was. You could feel the effective thrust pick up as the 'Drive finals resynchronized. ...After that, a couple of relatively-easy hours returning power plugs to the (new) normal condition, restowing and cleaning-up, and I was free. The nice thing about being in Engineering is that your card key gets you just about anywhere it's safe to go unescorted (and many places that aren't). The kitchens, for instance. The kitchens where the chefs and lower food-service ranks were using up odds and ends to feed -- and amuse -- themselves. Or just past just in. Worked all night, planned outage, some surprise consequences. Cooking now, more later! ...Sometimes even if you're clueless on how to shoot it. Even if it's a BB gun! I don't recommend that method but it worked. The tl;dr version: a woman in Muncie, a mom with grown kids, surprised an intruder (taking her Xbox apart!) in her home and reached for the shotgun she'd never shot. Picked up a BB gun instead, which proved to be more of a threat than the intruder cared to brave; she marched him outside and yelled next door for her adult son to call 911. The lifting-body airship just won't lay down and die; there's a half-scale model (with an uncanny resemblance to a Gerry Anderson prop) slated to fly shortly, accompanied by the usual "military applications..." boilerplate. Much as I love 'em -- and I do -- that'd be a big ol' NO. Airships are not a really great choice for anything but well-behind-lines military apps: they're slow (even the fast ones) and large, which adds up to "target!" Helium doesn't burn but it leaks right out and once you've done the shoulder-fired ground-to-air rocket thing to a cell or three, brace for impact! And they require heap plenty ground crew and a place to put the vehicle when it's not flying -- while modern intelligent control systems will help reduce that, there's a limit to how far you can go keeping a gigantic lighter-than-air weathercock under control; if they're staying very long, they've got to go indoors, as the enormous hangars at Lakehurst, Akron and Sunnydale, Sunnyvale CA* attest. I think -- I hope! -- there's a future for airships, but it's hauling freight and passengers well away from war zones. Lowish, slowish, cheap and enormous aren't a problem for most tourists and many cargos. Figure out how to integrate containerized freight and you'd be onto something. * Not to mention Weeksville, NC, Écausseville, France or Rio de Janeiro -- "Airship hangar! It's the box white elephants are shipped in!" Clearly, this many empty hangars must indicate a shortage of dirigibles, no? If you build it...? Hasn't happened yet. Dean Ing once described conditions under which airships might become popular but let's not go there just now. Gotta take the trash out, check on the wet quilt I found in the washing machine last night, etc. etc. etc. See, I'm not Congress; sometimes I have to do actual work instead of just writing about what other people otta be doing. So...a grocery-store security worker got punched in the gut last night by a man allegedly (hem!) shoplifting Enfamil baby formula. The suspect got clean away, too. Security has to follow possible shoplifters outside or it's not quite stealing -- and this suspect had a van handy. Baby formula? What, he's Jean Valjean? There is a lesson here and it applies to more than drugs: makers and sellers of an illegal product need make no big effort at purity, strength or even safety. What are customers going to do, sue? This lesson should have been learned during Prohibition. It wasn't. --And all of those people who would outlaw guns? Rethink. If possessing an "illegal" semiautomatic firearm carries the same penalty as possessing a fully-automatic version, what do you think will happen? Christmas morning, I had a surprise. As the day approached, Tam had been chortling over her gift choice with more than her usual vigor; this should've clued me but I was largely oblivious other than making up my mind that whatever it was, I was going to treat it as the Greatest. Gift. Evar. Oh, me of little faith. 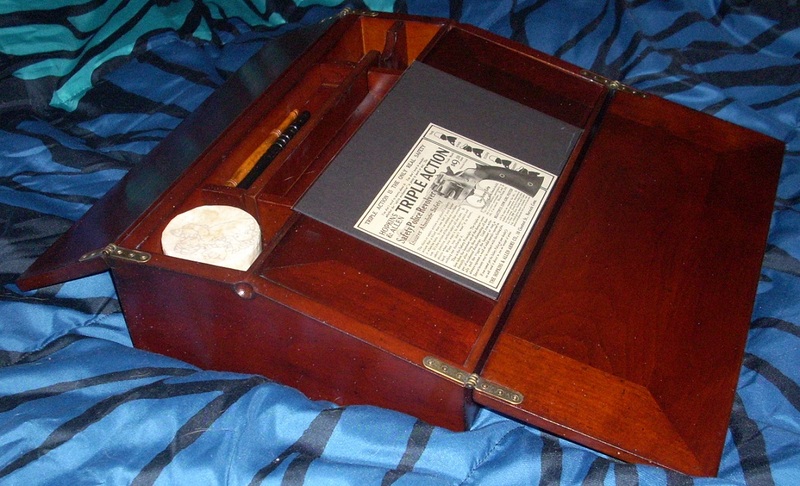 Comes the day, Tam traipsed downstairs from her attic lair carrying what appeared to be -- and was -- an old-fashioned wooden "lap desk" or secretary -- a very handy item, once used on tabletops as often as laps. That was kewl indeed and I was impressed. 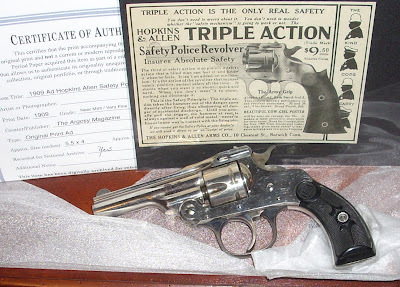 Inside, under the front flap, that was an ad for a classic top-break revolver and a certificate attesting that it was an original, clipped right right out of a 1909 back number of Argosy (a fiction pulp back then). Kewler! The front flap merely completes the slant of the top of the gadget down to the surface it sits on; there's another lid under it, which forms the upper portion of the writing surface. "Open it the rest of the way," Tam told me. Yep. It's a nicely-nickled Hopkins & Allen top-break in .32 S&W* from 1909, just like one in the ad except for the stocks! Very nearly pristine; it may have been fired once or twice and it appears to have been kept well-cleaned and oiled but its the newest over-hundred-year-old gun I've ever seen. Tam was right to be gleeful. It was a perfect choice. Thank you, Lodger! * Lighter and less filling than your regular .32 and yet -- still quite, quite ouchy. Handle with care! Loading up bookstore-finds in the trunk of Turk Turon's rental car, I noticed the glow-in-the-dark emergency escape T-hand carries the international symbols for "if locked in, pull handle, leap out and run away!" We Are Saved, We Are...Saved? Calamity (barely, and no thanks to the eeeeeevil GOP, who actually tolerate dissension in their ranks) averted, the olde-timey media assure me, with their funny, old-fashioned way of looking at things. Oh, Hells no. The Fed.gov -- and the House in its role as money manager especially -- was (and is) in the position of the guy paying off loans and buying groceries with credit cards who keeps getting more loans to pay the credit card bills; for just a bit there, it seemed possible they might spend a little less and grab a bit more money to pay things with. (Sure, it's your money and mine and darned sure, I don't approve of the grabbing -- still, as governments go, it almost made sense, aside from the clown-car disproportion of the whole scheme). This entire brouhaha amounts to my initial example, the guy juggling credit he hasn't got, agonizing over the cost of a cheap steak dinner. Eat it or not, it's as nothing compared to the staggering stampede of the real defecit. And not a thing has been done to stop it. * Thus proving the rule of thumb that no matter how much you make, your mental image of the "the big bucks" is twice as that amount. "Philosopher-Kings? Clean-up on aisle DC!" Are we not fortunate to be in such exceptionally-clever hands? Aren't we? From Taste, listed on the menu as "Pork belly and eggs, with our potatoes," it's got mushrooms, brown gravy, quartered and sauteed violet brussels sprouts* and home-made biscuits, artfully stacked (note sunnyside-up eggs near the top, runny-yolked yet intact), dusted with grated cheese and radiatiating splendidness. Easily one of the top three breakfasts of my entire life. May your New year consist of such fine starts to each and every day -- literally, figuratively or -- why not? -- both! * No, you don't have to eat them -- but you'll be missing a treat; they are a perfect fit with everything else. Only violet on the inside -- there's one visible in the photo at the right, between egg white and pork belly.